Over the past several seasons, Week 2 has featured the highest concentration of games against out-of-state opponents, but 2017 is a slight departure from recent years. Of the record 45 games against non-Utah teams, 13 occur during Week 2 and 13 during Week 3. Monument Valley and Whitehorse play 11 of those games competing as independents against other Navajo Nation schools. Excluding their schedules, 26 of this season’s 34 games versus non-Utah teams are contested the next two weeks. Four schools play their first-ever game against an out-of-state opponent. Herriman, in its eighth season, travels to Helix High (La Mesa, Calif.) this week. For its first trip across state lines, six-year-old Summit Academy visits Wendell (Idaho) on Sept. 8. Rigdeline, in just its second season, hosts Raymond (Alberta, Canada) on Sept. 1. That game marks the fourth time Raymond has faced a Utah team and the sixth time an opponent from Canada has played a Utah squad. In previous games, Raymond defeated Juan Diego, 27-13, in 2000 and Bear River, 46-8, in 2008 before falling to Orem, 28-21, in 2009. Utah teams prevailed over the other two Canadian opponents: Cedar rocked Lethbridge (Alberta), 29-0, in 2002 and Parowan nipped Winston Churchill (Lethbridge, Alberta), 7-0, in 2005. Green Canyon, in its inaugural season, clashes with two out-of-state foes: The Wolves tussle with Shelley (Idaho) this week in Pocatello, Idaho and host Chugiak (Anchorage, Alaska) on Sept. 8. GC becomes the third Utah school to play a team from The Last Frontier: American Fork brutalized East Anchorage, 42-7, in 2007 and Pine View blasted Juneau-Douglas, 46-13, in 2009. Hurricane will face Christian High School from the San Diego are today as well. Perhaps the highest profile games this season feature Bingham against Hawaii power Kahuku, in Las Vegas on Sept. 9 (Week 4), and East hosting IMG Academy (Bradenton, Fla.) on Oct. 20. IMG Academy currently tops the national MaxPreps Freeman Rankings, while East places fourth. IMG describes itself as a multi-sport training destination, “a driven group of people united by a common passion for sport.” The school integrates academics and athletics on its 450-acre campus near Tampa and likely attracts very specialized students looking to improve their options, or should we say, college recruiting opportunities. The annual tuition is a jaw-dropping $75,200, including room and board. Plus a $4,500 “competition” fee for football. It’s “only” $56,900 if you live and eat off campus. Plus the $4,500 football fee. Four Utah teams have been invited to Under Armour’s Brothers-in-Arms Classic, which is a series of 26 games in California, Louisiana and Maryland involving teams from 17 states and the District of Columbia and spanning nine weeks from Aug. 25 through Oct. 20. The classic honors Lt. Brendan Looney, a Navy Seal who died in Afghanistan in 2010, and seeks to “teach about true leadership and sacrifice … and inspire a generation of future leaders” according to its website. Utah teams travel to Mission Viejo, Calif., for their games. 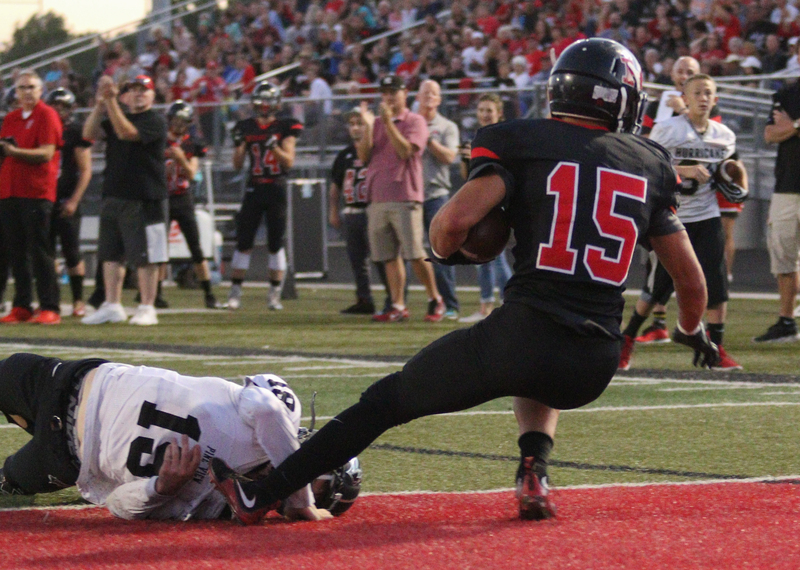 American Fork tangles with Servite (Anaheim, Calif.) on Sept. 1. Orem meets Bakersfield (Calif.) and Timpview battles Del Oro (Sacramento, Calif.) on Sept. 2. Two weeks later, Layton Christian faces San Lorenzo Valley, a school in Felton, Calif., near Santa Cruz, on Sept. 16. Some teams seek out-of-state competition for geographical reasons, others as a test against non-Utah powers and still others because they’re unable to schedule an in-state opponent one particular week. But 10 schools currently fielding teams haven’t seen the need to battle a non-Utah school. Four of those, Corner Canyon, Maple Mountain, Skyridge and Wayne, have been playing football for less than 10 seasons. But Murray has gone 100 years without facing an out-of-state team, South Sevier has gone 63, Bountiful, 62, Kearns, 52, Timpanogos, 22 and Salem Hills, 10. Utah’s all-time record against out-of-state opponents is 1,194-981-69 (.547). That’s 2,244 games since West (then known as Salt Lake High) tied Denver East 0-0 in 1899 in the first contest involving a non-Utah foe. That game, played in Salt Lake, included Governor M. Wells among the estimated 4,000 spectators. That was a large crowd for a prep game at the time, when high school games typically attracted 300 to 500 fans. The game was of such magnitude that drug stores around the city sold tickets in the weeks leading up to the contest. Those 2,244 games equal just over seven percent of all Utah prep contests. Among Utah high schools, Grand County has played the most games, 178, against non-Utah foes. (Forty-three of those games have been against Montezuma-Cortez, Colo.; they meet for the 44th time this weekend, in Cortez.) San Juan is next with 124 contests, followed by Whitehorse, 123; Monument Valley, 119 and Hurricane, 96. The rest of the Top-10: Monticello, 88; Dixie, 83; Rich, 75; Carbon, 65 and Logan 60. The rest of the Top-10 out-of-state opponents: Lincoln County (Panaca), Nev., 117; Moapa Valley (Overton), Nev., 114; White Pine (Ely), Nev., 80; Virgin Valley (Mesquite), Nev., 77; Grand Junction, Colo., 74; Montezuma-Cortez, Colo., 59; Pocatello, Idaho, 52; Rangely, Colo., 50 and Las Vegas, Nev., 40. Eleven of this week’s games feature first-time pairings and five of those involve non-state battles. Two come in the Rocky Mountain Rumble in Pocatello where Grantsville faces Minico (Rupert, Idaho) and Green Canyon plays Shelley (Idaho). In the Orem Vivint Invitational, Orem hosts Sutter (Calif.) Union on Saturday. Skyline was scheduled to meet South Tahoe (Nev.), but South Tahoe backed out of the agreement just before the season started. Other out-of-state, first-time meetings include Herriman visiting Helix (La Mesa, Calif.) and Hurricane entertaining Christian (El Cajon, Calif.). The six first-time meetings between in-state teams: Bountiful at Hunter, Copper Hills at Ben Lomond, Riverton at Corner Canyon, Skyridge at Murray, Stansbury at Taylorsville and Wasatch at Mountain Crest. Three of the top-10 most-played rivalries are contested this week. Box Elder hosts Bear River in the Golden Spike game. It’s the 97th meeting since 1923 and represents the longest uninterrupted series, the most-played active rivalry and the third longest series overall. Box Elder leads the series, 69-25-2 and has won six straight over the Bears. Also, Springville travels to Spanish Fork for their 91st matchup, the eighth most-played rivalry. Springville leads this one, 46-41-3, since 1920 and has taken four straight from the Dons. Beaver and Kanab clash for the 89th time, this year in Beaver, which controls the series 50-38. Since the series began in 1950, the two teams failed to meet only in 1951, ’55, and ’56. Beaver is on a seven-game winning streak against the Cowboys. A couple of game feature teams that meet for the 58th time: South Sevier at Richfield, which dominates the series 39-18 since 1920, and South Summit hosting Morgan, which controls the series 34-22-1 since 1942. Weber and Roy battle for the 53rd time, at Roy, which leads the series 30-22 and has won six in a row over the Warriors. In another long-running series, Viewmont invades Davis in their 50th meeting since 1946. Davis commands the series, 35-13-1. East plays its 950th game and Salem Hills game #100…. Eric Kjar directs his second contest at Corner Canyon, but it’s his 100th career game including 98 at Jordan. Twenty-six coaches with new teams roamed the sideline as the season began last week and compiled a 9-17 record. Twenty-one of them are in their first-ever year of coaching. Eight of those prevailed in their debut contests: Bart Brockbank (Lone Peak), Andrew Fresques (Woods Cross), Jeff Lewis (Tooele), Jon Marshall (Beaver), Carter Miller (Parowan), Danilo Robinson (Sky View), Harry Schwenke (Salem Hills) and Kaleo Teriipaia (Jordan). Just one of five coaches who have returned this season as head mentors tasted success: Eric Kjar at Corner Canyon (previously at Jordan from 2009-16). One game this week pits first-year coaches against each other: Danilo Robinson of Sky View matches wits with Jeff Lewis of Tooele. Lehi’s wild 72-66 double-overtime victory over Alta produced more than its share of state records and top-10 performances. The teams combined for 1,486 yards of total offense, the second-most in state history. Lehi accumulated 744 yards of total offense, the sixth-most all-time for one team, while Alta was right behind with 742 yards, the seventh-most all-time. Their combined 138 points is the fourth-most ever in a Utah prep football game. Back to state rankings: Cooper is tied for third in touchdowns-responsible-for (10) and seventh in total offense (617 yards). Over his career, Cooper now ranks fourth in completions (587), fifth in attempts (961), 10th in passing yards (7,214) and 16th in TD passes (68). Dallin Holker, Cooper’s favorite receiver, also set a state record for TD receptions with five. He’s the sixth player to accomplish that feat. He also had 274 receiving yards, good for the sixth-most all-time. One other interesting note from that game: Alta’s Zach Engstrom and Lehi’s Holker each totaled 313 all-purpose yards, although Engstrom obtained most of his – 213 – from rushing, while Holker got his – 274 – on receptions. Clearfield played it 25th overtime contest, tying with Highland for the most in state history. See you on the sidelines! George Felt is a resident of northern Utah and is widely considered the premier expert on high school football in the Beehive State. He published two books in the 1990s on the history of Utah high school football and, as Utah's unofficial prep football historian, provides Felt's Facts to the media and gridiron fans each week.